4615 at Eveleigh on 14th December 2002 after SETS Airport Colliery Tour. Photograph by Hugh Burns. Built by Metropolitan-Vickers & Beyer-Peacock in Britain for the NSW Government Railways, electric locomotive 4615 was completed on 22nd September 1956, was landed in Sydney on 15th November 1956 and entered service on 21st January 1957. It had an operational life of nearly 39 years before retirement on 17th January 1996. It was sold for preservation on 20th April 1998, and is in operational condition. The "46 class" electric locomotives were ordered and designed for the electrification of the Sydney to Wallerawang route over the Blue Mountains in N.S.W. The motivation was an expected increase in the volume of coal to be shipped from the western coalfields beyond Lithgow, in the mid to late 1950s. This extra traffic would make the capacity of the then existing steam hauled double track Western Railway line inadequate. Electrification was determined to be the most cost effective method of increasing the capacity of this line. However the coal traffic estimates proved to be over optimistic and this, together with the location of a large existing steam locomotive depot at Lithgow, resulted in the electrification project being terminated at Bowenfels - on the outskirts of Lithgow. 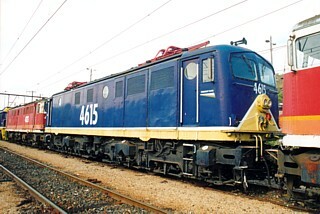 As a result of design experience gained with prototype electric locomotive 4501, the Mechanical Branch of the NSW Government Railways called tenders for the supply of 40 electric locomotives. British firm Metropolitan-Vickers was the successful tenderer and the first of the class entered service during June 1956, twelve months before completion of electrification to Bowenfels. The 46 class locomotives were constructed by Metropolitan-Vickers Beyer-Peacock at Stockton in Britain, with electrical equipment made in Manchester and Sheffield. 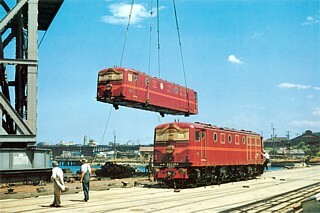 The 40 members arrived in Sydney, assembled, between May 1956 and February 1958. As electrification progressed across the Blue Mountains from Emu Plains, the 46 class began assisting steam-hauled trains in progressive stages until total electrification to Lithgow and Bowenfels was achieved on 9 June 1957, allowing the withdrawal of steam operations over the mountains. On 15 November 1956, locomotive 4615 (builder's number 800) was landed in Sydney on the ship Jason, along with sister locomotive 4614. Due to a temporary surplus of electric motive power, it was not until 21 January 1957 that 4615 entered service. One of 4615's first duties was in forming, with 4606 and 4613, the official test train for the newly completed overhead section from Valley Heights to Katoomba. On delivery 4615 was painted in "Midland Red" (maroon) livery, relieved by the application of crimson bands around the bodywork. 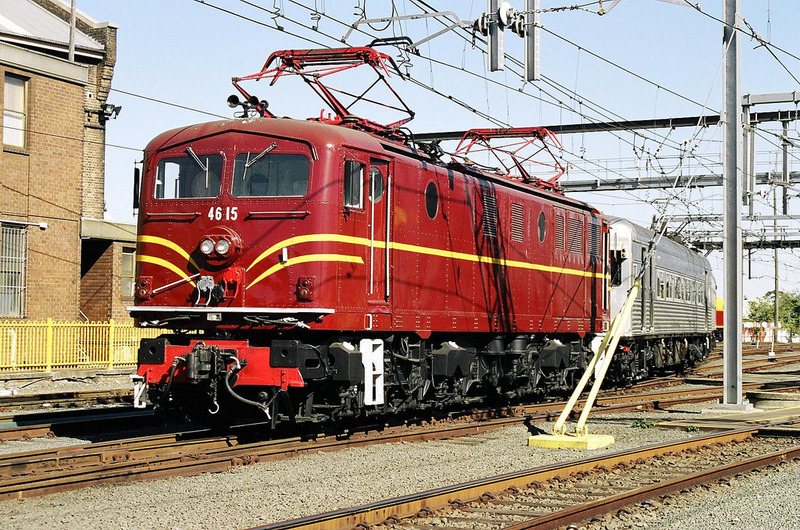 Along with its siblings, 4615 was initially based and maintained at Flemington Electric Train Car Sidings, until the opening in May 1958 of the purpose-built diesel and electric depot at Enfield, known as "Delec". 4615 received a new colour scheme of Tuscan red body lined with yellow stripes in April 1968. The majority of the class received the so-called "candy" colour scheme, first introduced in 1982, including 4615. A hand full of the 46 class received the 1992 Freightrail Blue livery, again including 4615, which was one of the last to be done. A brand new 4615 sits on Wharf 7 at Pyrmont around the 15th November 1956. 4614 is in the air behind, being lifted by the floating crane "Titan", partially visible on the left. Photograph by Noel Reed. The Metrovick electrical equipment includes; six MV272 traction motors, MG86 supply motor generator, MG92 exciter motor generator, two 20P pantographs and two AY52 compressor motors (fitted to two Westinghouse 2C75 compressors). Traction control is by means of the Metrovick "unit switch" system (electrically interlocked individual electro-pneumatic contactors). Control equipment is of the 1955 type, with manual notching and regenerative braking, directly operated by the driver's master controller (or jumpered train lines when operating in multiple unit). Thus, from January 1957 until January 1960, 4615 would have seen exclusive use on the western line to Lithgow, hauling both passenger and goods services. For a period before the introduction of the single-deck interurban electric train sets in 1958, 46 class locomotives also hauled the famous commuter expresses "The Fish" and "The Chips" until September and December 1958 respectively. In 1960 electrification of the Northern Line to Gosford was completed, with 46 class electric locomotives again being used to overcome capacity limiting gradients either side of the Hawkesbury River Bridge. 4615 in April 1998 in Lithgow yard sidings adjacent LMC with other stored 46 class units. Photograph by Hugh Burns. Most 46 class locomotives had a long service life, with all but two still in service early in 1990. However from this time onwards members of the class were progressively withdrawn, with the last 16 in service being stopped during January 1996. 4615 was one of these, being stopped on 17 January 1996, along with 6 others. This was the last day of service for the class, with official stowage being effected the same day. After the withdrawal, staff at Lithgow Locomotive Maintenance Centre, which maintained the electric locomotive fleet, selected 4638 as the officially retained operational heritage 46 class loco, on the basis of it being the last unit overhauled. Due to very good electrical and mechanical condition, and a late equipment change, 4615 was designated the companion heritage unit to 4638, with it also being retained in operable condition. For this purpose 4615 received a minor service which particularly included refitting of original Metrovick pantographs. Control of the 46 class locomotives passed from the State Rail Authority of NSW to the newly corporatised FreightCorp (which operated all the previously SRA freight services). 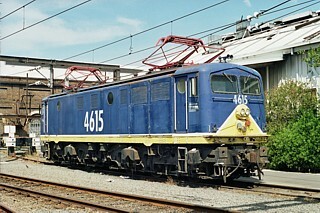 Thus 4615 was sold by FreightCorp to the Sydney Electric Train Society on 20th April 1998. 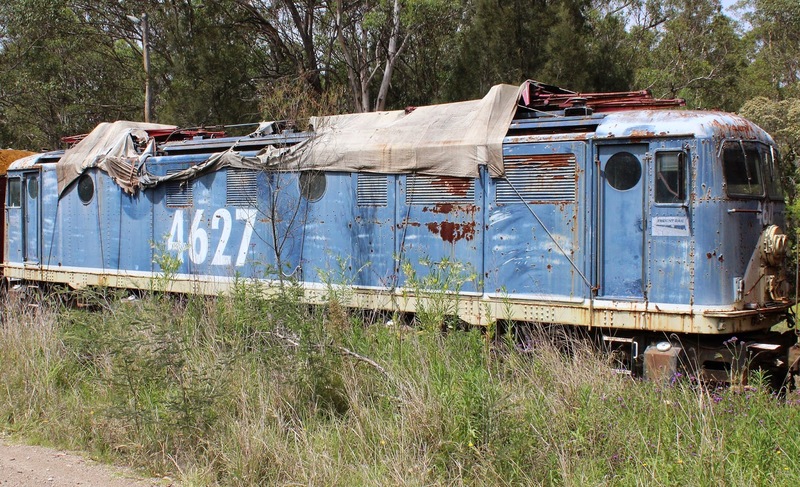 Other preserved 46 class units are held by the NSW Rail Transport Museum (4601 and 4638), and Railway Museums at Dorrigo (4602), and Rothbury (4627). All retained units other than 4601 are complete. The remaining balance of the class were scrapped at Simsmetal Mascot in mid to late 1998. After completion of remedial trackwork on their branch line, 4615 was transferred to the State Mine Heritage Park and Railway at Lithgow for storage on 4th October 1998. 4615 was also the last 46 class locomotive to leave Lithgow Maintenance Centre, being operated out and across Lithgow Yard under electric power. 4615 sits at the end of the overhead on the Sandown line on 20th December 2002. Photograph by Hugh Burns. Following the SETS "86 Class Farewell Tour" on 7th September 2002 (which marked the end of commercial use of electric locomotives in NSW), key staff from Lithgow Locomotive Maintenance Centre urged that 4615 be returned to traffic and generously offered their assistance. After an inspection confirmed that the locomotive remained in excellent mechanical and electrical condition, these works were completed between October and early December 2002. 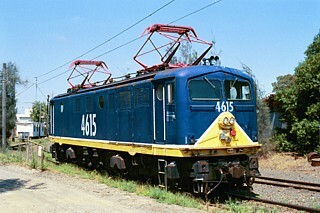 4615 was transferred from State Mine back down to Lithgow Yard (and under the overhead) on 30th November 2002. It was successfully trialed light engine to Mount Victoria and return on 5th December 2002. The locomotive was operated light engine from Lithgow to Eveleigh in Sydney on 6th December, and ran its first scheduled Society trip on the 7th December 2002 - the "Airport Colliery 46 Class Tour". 4615 also made a test run trip to Sandown on Friday 20th December 2002, becoming the last electric working on this industrial line, due to removal of the overhead wiring over the following weekend. More recently, 4615 was used for track circuit testing on the Eastern Suburbs Railway as part of the Edgecliff turnback alterations completed in February 2004. In June 2004, the locomotive was given an interim repaint into Indian Red with yellow whiskers and white numbers. This replicates one variation of the original 1968 whiskers livery applied to some members of this class. More extensive restoration of the external bodywork is planned. 4615 at Eveleigh on 28th May 2005 for the SETS First Passenger Electric Sesqui-Centenary Tour. Photograph by Michael McGinty. The locomotive was operated on Society outings on various occasions, the last being our "First Passenger Electric Sesqui-Centenary Tour" on the 28th May 2005. On 16th and 17th June 2018, 4615 and the other SETS items were transferred from Junee RoundHouse back to Pacific National's LMC Lithgow for reactivation. So far two refurbished original 20P Metrovick pantographs have been delivered to LMC for refitting, and all fire extinguishers have been replaced. It is currently planned for these works to be completed by early 2019. The selection, preservation and subsequent operation of 4615 by the Society was made possible with assistance from technical and supervisory staff at the Lithgow Locomotive Maintenance Centre. However, following the cessation of electric locomotive operations in N.S.W. at the end of June 2002, the "Home of the Electric Locomotive Fleet" was closed on 31 March 2003, after 117 years of locomotive depot operations in Lithgow. Similarly to 4615, locomotive 4627 was completed on 15th March 1957, landed in Sydney 9th May 1957 and entered service on 7th June 1957. It was withdrawn on 17th January 1996 - on the last day of service for the 46 class. Thus 4627 had a long operational life of over 38 years service. 4627 was originally purchased from FreightCorp by the Hunter Velley Railway Trust as part of the 46 class heritage group disposal process in 1998 (from which SETS received 4615). When the HVRT site was to be sold, a large part of their extensive collection was sold off to other groups, or in some cases scrapped. After the near loss of CF 5001, SETS decided to purchase 4627 in April 2013, so it would not be similarly at risk of being sent to scrap. Despite starting in nearly the same good physical condition as 4615 and being initially stored inside HVRT's locomotive shed, the loco bodywork has significantly deteriorated after it was moved to outside storage for around the last 15 years. Additionally some brake components were removed for use on other diesel locos. 4627 is currently due to be removed to a new storage location. Similarly Transport Heritage's (former RTM's) 4638 has been stored outside at Broadmeadow, and as 4627 and 8644 clearly show, outdoor storage in some locations is very detrimental to preserved steel rollingstock. Thus the importance of storing all N.S.W. heritage electric locomotives indoors needs to be emphasised. Locomotive notes by Stephen Halgren and Hugh Burns.